The C7 Z06 and Grand Sport are equipped with some really amazing stopping power. The massive Brembo system incorporates 14.5 inch rotors on the front and 13.5 inch on the rear are gripped by 6-piston front and 4 piston rear mono-block calipers. 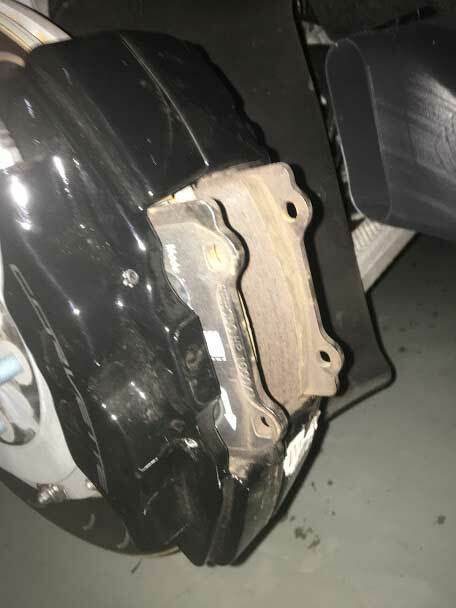 The semi metallic Brembo pads yield neck breaking stopping power. The only problem with this set up is the massive amount of brake dust that is emitted with every push of the brake pedal. I f you track your car dirty wheels and fenders are a badge of honor. Not so much if your car is street driven and you plan to show it. The first thing that gets judges in a show is the cleanliness of your wheels. Judges look at both the outside and inside of the wheels. Wheels laden with black brake dust have no chance of getting a trophy. A question that we are asked on a regular basis is," what can yo do to maintain great stopping power without all the mess"? Glad you asked, the simple solution is to change out those messy Brembo pads for a set of carbon ceramic units. Another question is," can you do this swap without breaking the bank"? The answer is a resounding "Yes". As you can see the price problem has been solved by a company called Power Stop. 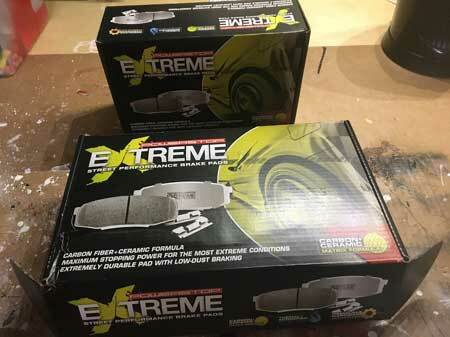 They offer quality carbon ceramic pads at a much lower price point as compared to most of the other aftermarket vendors. We chose the ZZ26 pads , part nos. 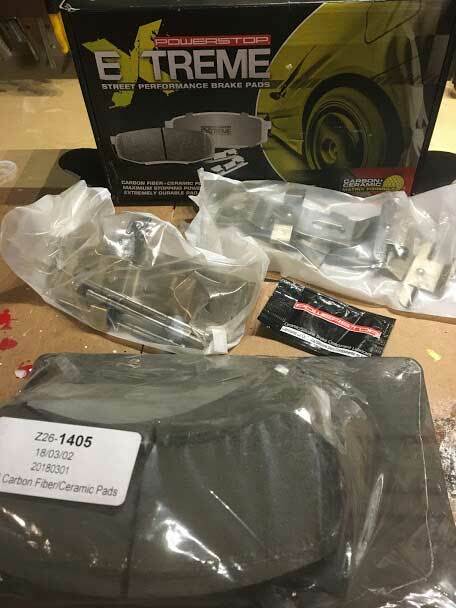 1718 and 1405 for our test of these pads on our 2016 C7 Z06. The installation of pads on a C7 Corvette is extremely easy, the hardest part of this task is jacking the car and removing the massive wheels. If you have a lift the only difficult task is manhandling the heavy tires. As we said installation is a snap. If you don't have a lift Jack up one side of the car. 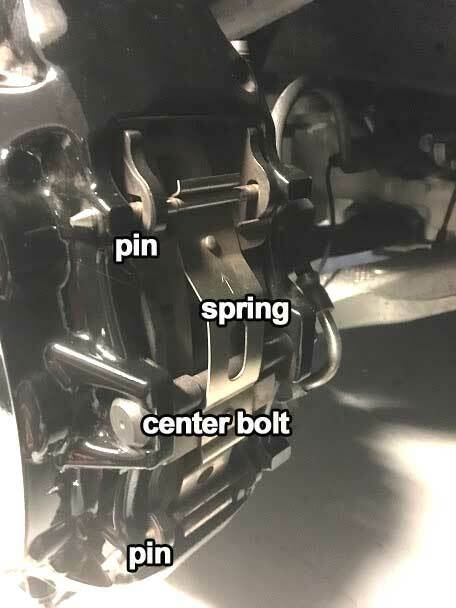 You will need a low profile race jack and a jacking puck. Do one wheel at a time, start with he driver side front tire. Place some wheel stops behind the other four tires prior to jacking. Give a slight turn to each lug nut prior to jacking the car, if you don't the front wheels will just spin when you try to loosen the nuts. Slowly jack the one corner of the car until you get the tire off the ground. Remove the lug nuts, mark the first lug and the the hole on the wheel prior to removing the wheel from the car. This way you can return the wheel to the same position and avoid any dynamic balancing problems. Now that the wheel has been removed you are ready to replace the pads. 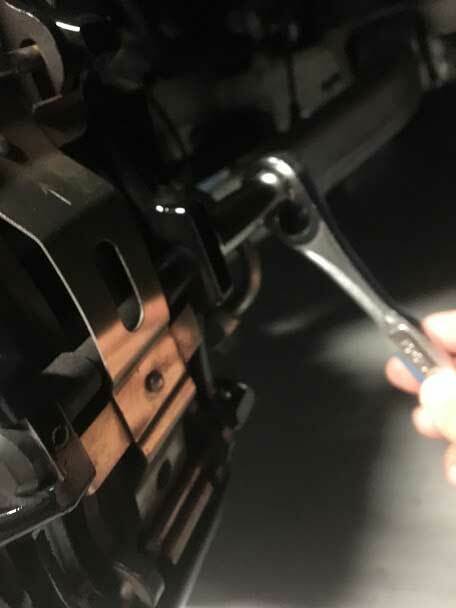 - Remove the nut from the long center bolt using a 13mm socket wrench. Pry the bolt out using a screwdriver or small pry tool. You may have to wiggle it a bit to get it to move. - Remove the two center pins that hold in the pad springs using a punch tool and a small hammer. Push down on the pad springs and pull out the pins. Note that there are two holes on the springs the long slotted hole always goes on the top. - Remove the old pads by first pushing them backwards and retracting the pistons. If they are not too worn you may be able to get them out with a little backward push. 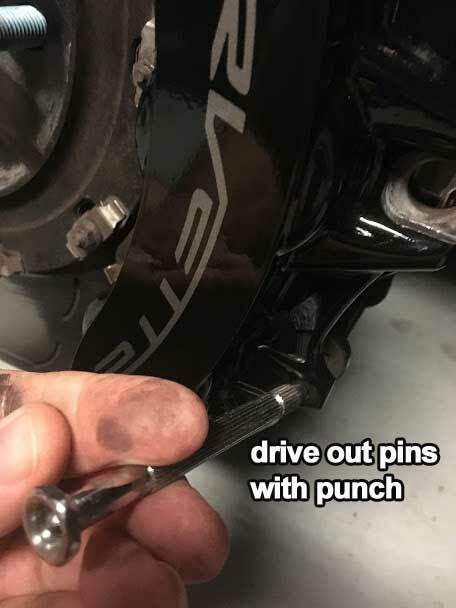 If this doesn't work you need to use a large flat head screwdriver to retract the pistons a bit. The inner and outer pads should wiggle out at that point. Note the position of the squeal indicators, inner pads indicator bottom, outer pad indicator top. - Retract the pistons - using a flat piece of metal and a small pry bar push the pistons into the caliper a bit. This will give you the clearance needed to install the new pads. - put some silicon grease on the outer edges of the new pads prior to inserting them into the caliper. Slide the new pads in place, make sure the pad friction material is facing the rotor surface. - Replace the long center bolt and nut. 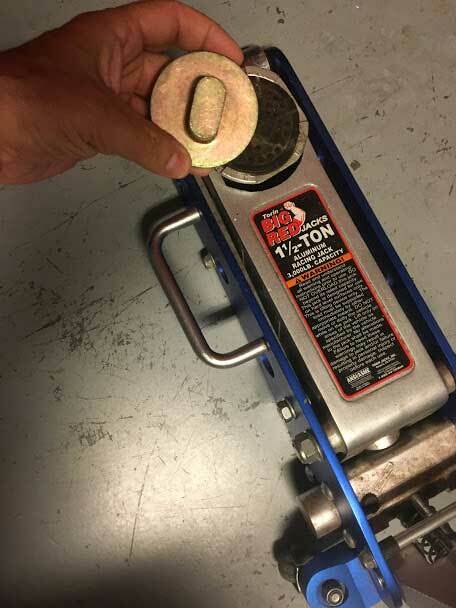 Tighten the nut to 22ft/lbs. - Replace the springs and pins. While putting pressure on the springs tap in the pins from the rear of the assembly. - Repeat the process for the other wheels. After you have all the new pads installed you have to bed them in. A very simple way to do this is to take the car out for a drive get the car up to about 40 mph and firmly step on the brake, do not bring the car to a complete stop. Do this three or four times. If there are no squeals of grinding noises congratulate yourself on a job well done. By doing the job yourself you just saved a couple of hundred dollars over the dealers labor costs and you can say good-by to dirty wheels forever. We have had these Power Stop units on our Project "Z" now for about 400 miles. They stop the car as well as the Brembo's there is absolutely no squealing or brake fade and more importantly absolutely no brake dust.